Beautiful! I always say painting with other artists is good for your soul. Stuck in a studio is pretty lonely sometimes. I can entertain myself though. Ha. 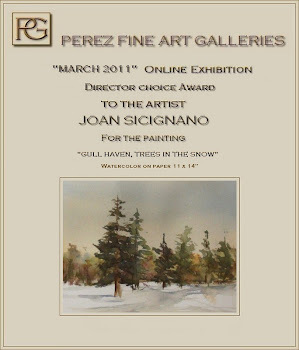 I LOVE your watercolor landscape.... always great to see a little of Long Island in your paintings!!! What a lovely work Joan. It is truly uplifting to spend time with fellow artists. It always gives me a new perspective. I have a dear friend who taught me how to use watercolors. When we get together for a few hours it is like putting me back in that special place. Have a delightful day.